This March, the Engineering Department opened the Welcome Center, a place where international students can get assistance with everyday problems and academic difficulties. Located in room 202 of building 38, the door of the Center opens to reveal a warm lounge area with an enthusiastic staff and student volunteers. Equipped with fluent English ability along with a wealth of relevant experience, the two staff members and the four student volunteers are willing and able to provide guidance. As for academic affairs, they walk the students through school policies, course registration, graduation requirements and scholarships. Beyond academic issues, they provide valuable information in areas such as visa issue/renewal, housing, phone registration, health insurance, and working student opportunities. They also offer free Korean classes for students not yet accustomed to the language. One can even get help with day-to-day concerns, such as interpreting your child’s kindergarten performance report or using the equipment in the SNU Idea Factory correctly. The Welcome Center also serves as a perfect networking place for international students. With comfortable sofas, free Wi-Fi, and complimentary drinks and snacks, the atmosphere is very friendly and welcoming. 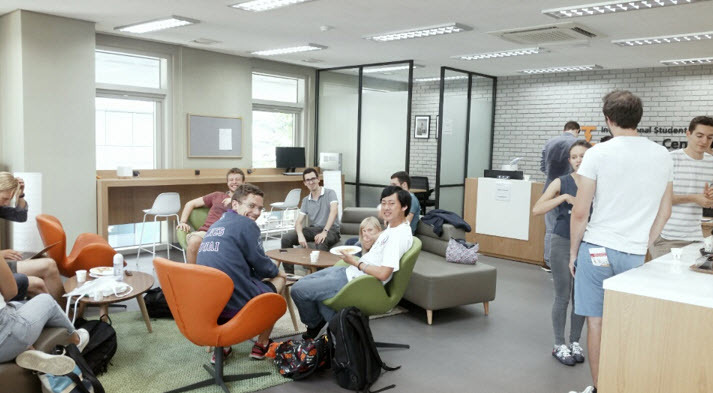 Furthermore, the Center regularly hosts a variety of social events, including pizza parties and Korean cultural activities such as making kimchi. It is no surprise that the number of visitors for the eight months that the Center has been in service has already reached 1000. “Our long-term goal is to foster internationalization in SNU,” Eunjeong Kim, a student adviser, says. “The students who come here are from diverse backgrounds. As they share their positive experiences of the Center with their family and friends in their hometown, it would help paint a positive picture of SNU.” With its helpful staff and friendly environment that makes the students feel truly “welcomed,” the Center is well on its way to achieving that goal.